I do not have a problem with the sound on this excellent box set, as some seem to. I find it exceptionally good - big, full, bassy and blissfully LOUD!! It's NAZARETH for Heaven's sake. Play them loud or don't play them at all. 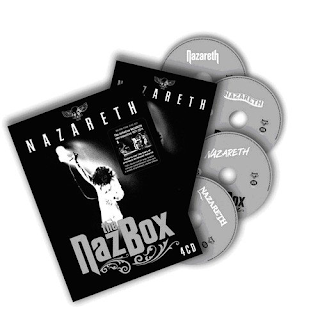 Regarding the selections on here, it is a career-spanning compilation using about three tracks from each of Nazareth's many albums. Great stuff it is too. The hits are all here - "Broken Down Angel"; "Bad Bad Boy"; "This Flight Tonight"; "Shanghai'd In Shanghai"; "My White Bicycle" and "Love Hurts". Plus iconic album tracks like "Razamanaz"; "Woke Up This Morning"; "Go Down Fighting" and "Hair Of The Dog". Of interest to me, (as I already owned the albums) is the live material - from London's Paris Theatre in 1972, 1973 and 1975 (the later including some of Dan McCafferty's solo material - "The Honky Tonk Downstairs" and "Watcha Gonna Do About It" - and then BBC "Sight And Sound" live cuts from 1977. Nazareth could play live. By God could they. These recordings prove it. Thanks for the memories, lads.